There’s no doubt about it, James Bond, the venerable double-aught-seven himself, needed a serious make-over. What once worked (surprisingly well) for a jet-setting 60’s crowd of post-Camelot cold-warriors no longer worked for a generation too ADD-addled for the absurd, escapist action and too edgy, even cynical, for they type of tongue-in-cheek ribaldry and blatant sexism that was often present in their parent’s (and grandparent’s!) vision of Ian Fleming’s super spy. James Bond received more than a make-over with this Martin Campbell directed Bond is much more in tune with the types of conflicted anti-hero’s we’ve come to know and love since guys like Frank Miller re-invented the superhero with his moodier, darker Batman… Bond’s current incarnation, well acted by Daniel Craig, seems to enjoy brooding as much as a certain winged vigilante, while at the same time remaining true to Fleming’s view of a British agent who’s so closely tied to his licensed killer status that he’s constant in danger of losing his soul. The action is the star, and it’s amazing, white-knuckle stuff, but the rest of the cast is also very good with Judi Densch reprising “M,” a role she now pretty much owns. 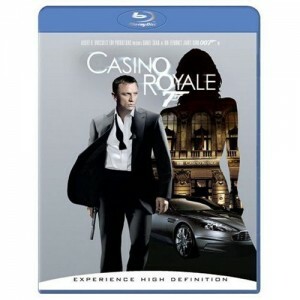 Casino Royale is a surprisingly great action film that offers a new Bond mythology for a new generation of fans, but respects the Bond of Fleming even more than the last spate of films in the series. The Blu-ray disc is a fine transfer, but not a knockout showcase disc. It offers MPEG-4 compression with a theatrical widescreen ratio, 2:40:1, at 1920x1080p… resolution is nice, not too sharp and the color pops. The disc offers a nice PCM 5.1 surround mix isn’t muddy as with some action films where gunfire gets buried in the rumble of an explosion, it’s a warm mix and the dialogue is fully discernable (French and Spanish surround tracks are offered as well). Extras are pretty light for such a cool film that was critically and commercially successful. You get the hi-def 27-minute featurette called “Becoming Bond”, a pretty good look at how Daniel Craig took on the role in the face of intense fan pressure. 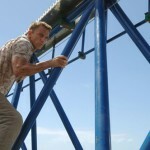 This featurette has some great interviews with director Campbell and writer Paul Haggis, Neal Purvis and Robert Wade; “James Bond For Real” is not exactly what you think but rather covers the eye-popping stunts from the film; “Bond Girls Are Forever”, hosted by a former Bond-girl, Maryam D’Abo, has some terrific interview footage with some well-aged femme fatales from Bond’s cinematic past and clocks in at almost 50-minutes. These women have some great recollections of the various Bond’s on-screen sexual prowess that’s nearly worth the price of the disc alone. You also get a music video from former Soundgarden (current Audioslave) singer Chris Cornell that redefines the pop-themes of past Bond films in favor of a rock sound. 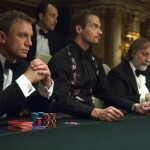 Trailers are for other Sony releases not for the Bond film itself. Next Next post: Blu-ray vs. HD DVD: Waiting for the war to end?